The International School Award (ISA) is a prestigious accreditation scheme, managed by the British Council. The Award recognises and celebrates schools that are committed to developing international partnerships which enrich the curriculum and help young learners to become global citizens. Y3 & Y4 - Eve Wasley, Michael Cree, Thomas Maltby, Joseph Wood. Y5 - Lewis Foggett, Ellie-May Goddard, Zac Ashley-Rogers, Mya Best. Y6 - Molly McMillan, Ryan Spencer, Lilly-Mae Addison, Theo Leesing. This week our International Champions have been starting to collect and film clips to add with our partner school. We aim to make a music video to the song Wavin' Flag. 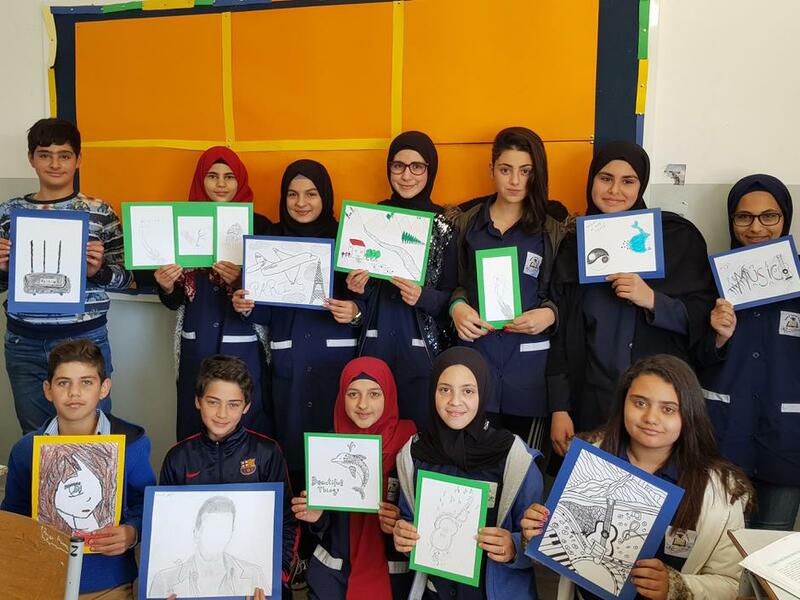 We completed a similar project last year with our partner school Abbesseih High Public School in Lebanon and with Gipsey Bridge Academy and Francis Olive Anderson school. Below is a link to our last years video which has been shared at different International School Conferences such as MENA. This week the whole school has been taking part in Swedish Week. We began each day by having a mile jog around the field. We then entered school in our 'own clothes' and made sure to take our shoes off at the door. No shoes were worn in school all week. Each class took part and all lessons focused around independent investigations and exploration. 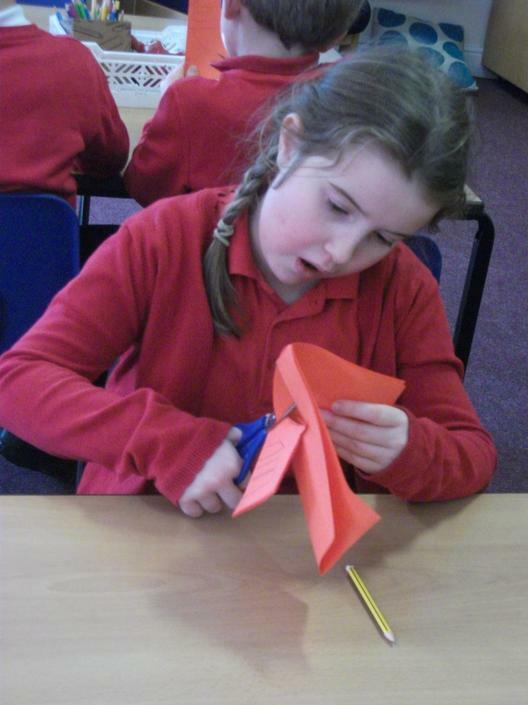 Each class also took part in creativity lessons through out the week and learnt skills in either needlework or woodwork. Year 4 even learnt to count in Swedish and had a Skype session with someone who lives in Sweden to ask some questions. We had a fantastic week, here are some quotes from our students. Year 1: 'Swedish week is so much fun already, ' 9.08am Monday morning. In April 2018, Mrs Hodson, Mrs Hutchinson, Miss Babiczuk, Mrs Speirs-Davies, Miss Holden, Miss Ash & Ms Williams travelled to Stockholm, Sweden to take part in a creativity programme funded through Erasmus+. It was a great opportunity to visit 5 schools in Stockholm and learn about their curriculum. Watch this space to see some of our future projects, inspired from our visit! Children across school have spent the fortnight learning about and celebrating Fairtrade. The fortnight began by a whole school assembly all about Fairtrade which was led by the school International Council. Each class then had another collective worship within their classrooms. Children have been looking at what Fairtrade is, why it is important, and how we can spot Fairtrade products. In February 2018 seven members of our school staff went to the Centre International d'Antibes to participate in a French Languages course. Our children have been writing letters to children in french schools and taking part in lots of exciting language learning. 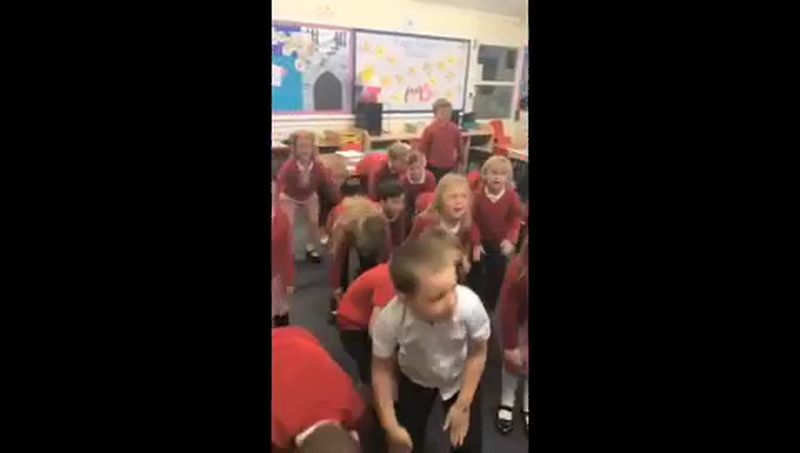 Here is a clip of our Year 1's doing some amazing french singing. Keep tuned for some clips from other year groups. 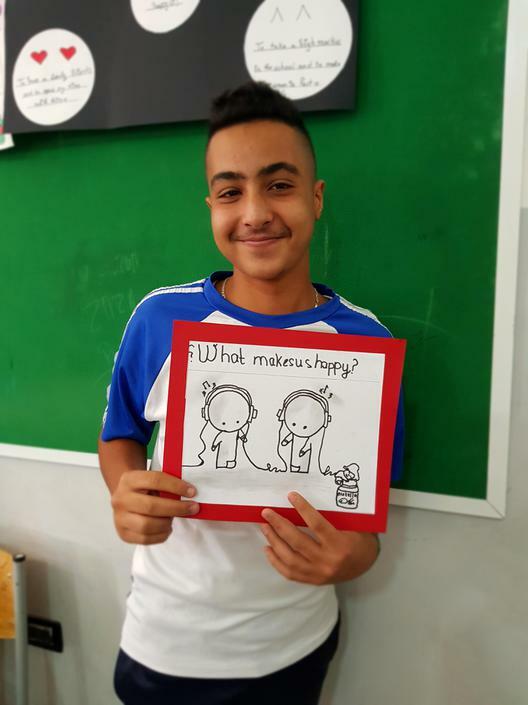 As a school we completed a project looking at 'What makes us happy?' 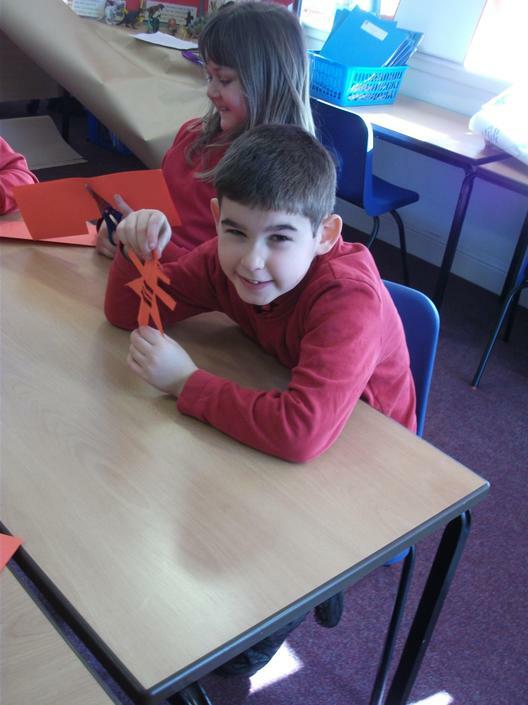 Each class produced some work representing the different things that make us happy. We had class discussions and shared our work with our partner school in Lebanon. 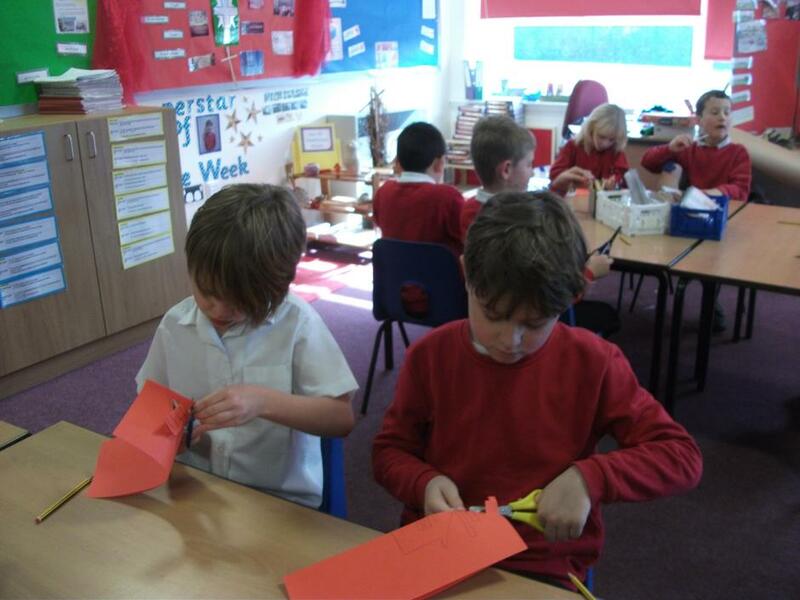 Here are some photographs of the work we shared. 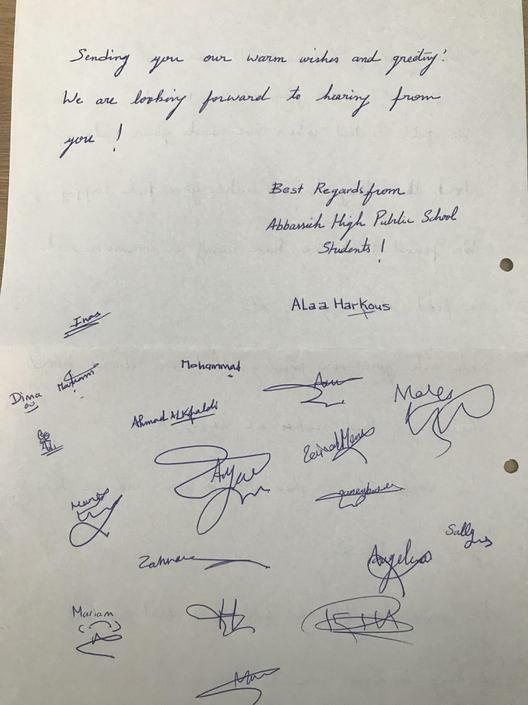 We recently received a parcel from our Partner School Abbasseih High Public School in Lebanon. 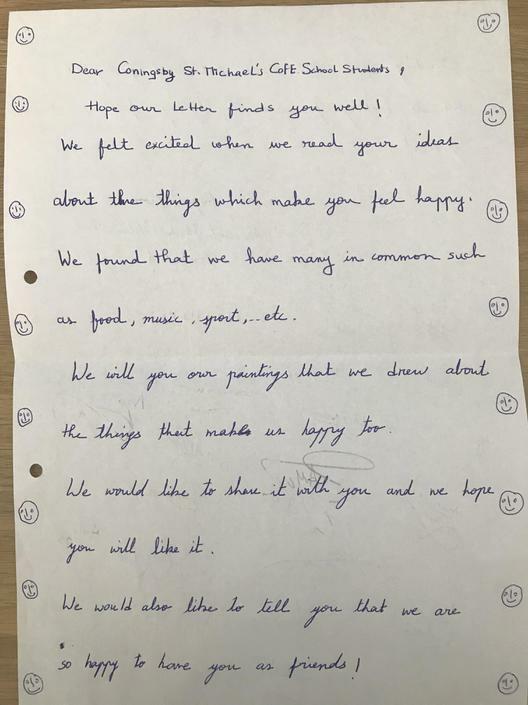 The sent us a letter about our 'What makes us happy project' and lots of samples of our work. These are now displayed in our school for everyone to see. It has been lovely sharing our ideas and comparing the things that make us all happy. Our International Champions have been busy with year 4 researching tourism in Lebanon. Our International Champions worked hard to organise the research and plan how to present it on their very own display board. 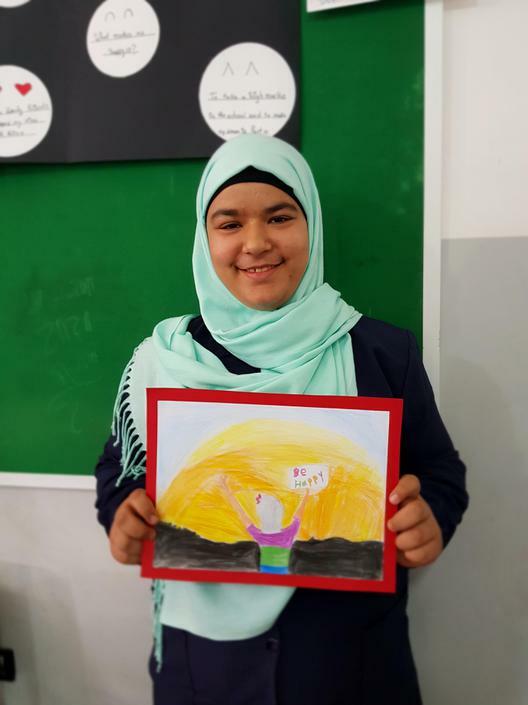 All of our work was then shared with our partner school Abbessieh High Public School in Lebanon. They sent us their own Powerpoint Presentations and photographs of their research about tourism in the UK. Each year as a whole school we celebrate World Hello Day. World Hello Day is a simple way to encourage communication and dialogue between people from different cultures and backgrounds to promote peace and understanding. 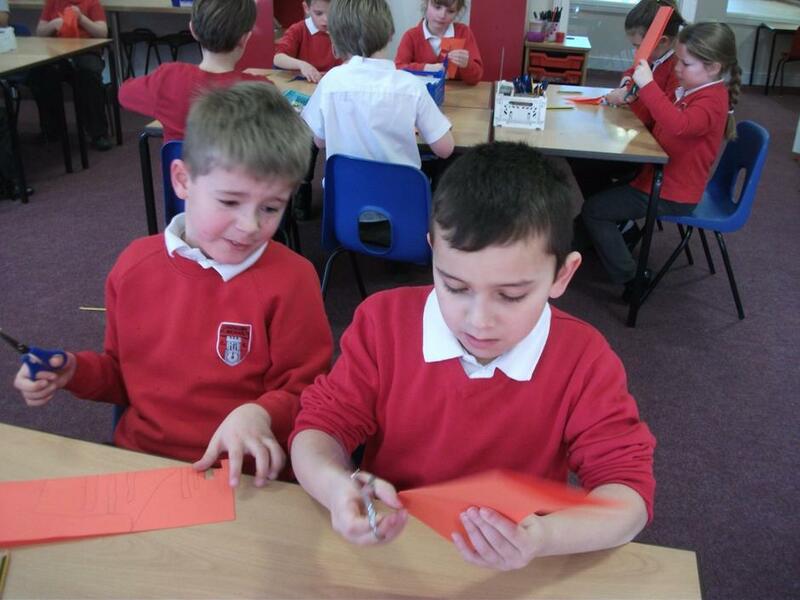 This year each class in Coningsby St Michaels created a picture of saying hello in different languages. We then sent these out on twitter to see how far around the world we could send our Hellos. 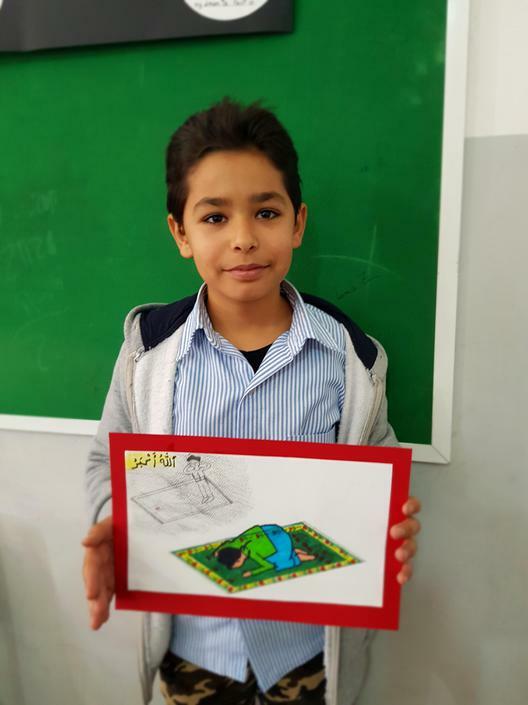 We have been working as a whole school to complete a project with our partner school Abbassieh Public High School to work on the project 'From the Window. Children in all classes have recorded what they can see from our classroom windows, these included considering factors such as weather, mood, buildings, views and colours. 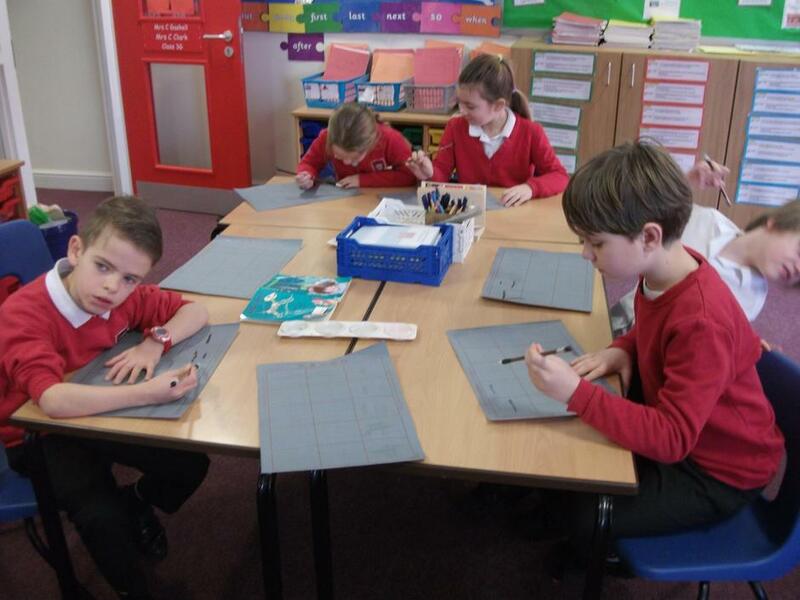 The work was different in each class and showed a range of different responses to the topic stimulus. Some created collages, landscape paintings, abstract drawings and written descriptions about the view were also included. These we sent to our partner school and our work was exchanged. Our International Champions led an assembly on the project and shared the work we received from Lebanon. It was interesting to compare and contrast our views and our styles of artwork. 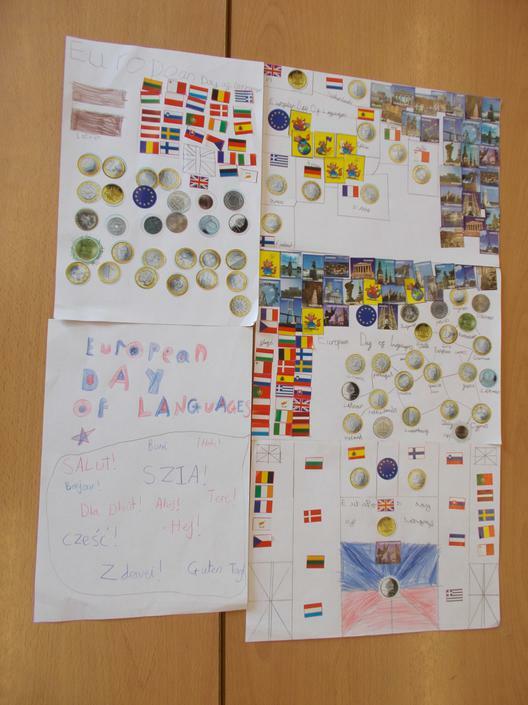 Each class in school took part in the European Languages Day by learning some key phrases in different Languages. EYFS and KS1 looked at learning French. Each class learnt some key phrases and some even enjoyed learning facts about France, drawing the flag and learning to sing Tête, épaules, genoux et piers and Frère Jacques. In Years 3 and 4 children were learning Spanish and enjoyed singing lots of songs. Year 5 and 6 were learning German and Year 5 even had a full German lesson with Miss Ash. An International Schools Project - partner schools from Lincolnshire and Lebanon. 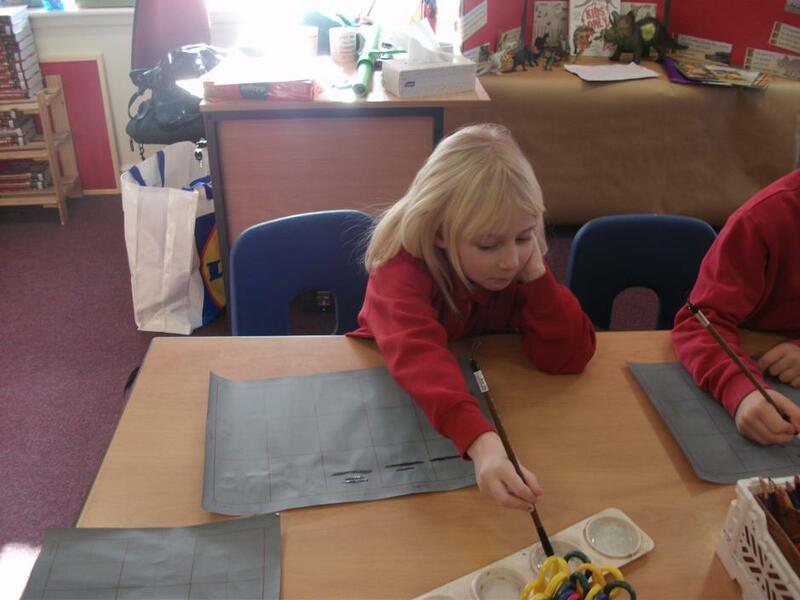 On Monday 26th June our Year 2 students went to Barnes Wallis Academy for a Cultural Day. The day included lots of different activities: at one point they walked around the school field with a bottle of water (1 land 2 litres) representing children in a less fortunate situation who have to walk miles to collect water every day; they petted animals like Turtles, Hamsters, Rabbits and African worms; filtering dirty water; made a shelter to protect toys from the rain; they sang opera; they planted pumpkins beetroot and lettuce, and had a healthy lunch. The aim of the day was to have an insight into the lives of others. Year 2 loved their day and had a brilliant time. 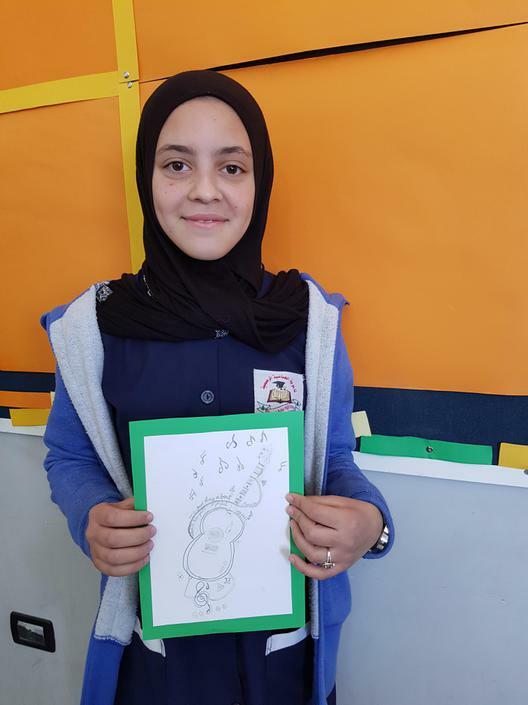 In February 2017, Mrs Hodson & Miss Babiczuk travelled to Amman, Jordan to take part in a Connecting Classrooms Conference through the British Council. It was a great opportunity to work with the International School Leader from our partner school in Lebanon...watch this space to see some of our future projects!!! ​We were presented with our International School Status on Friday 8 January 2016. 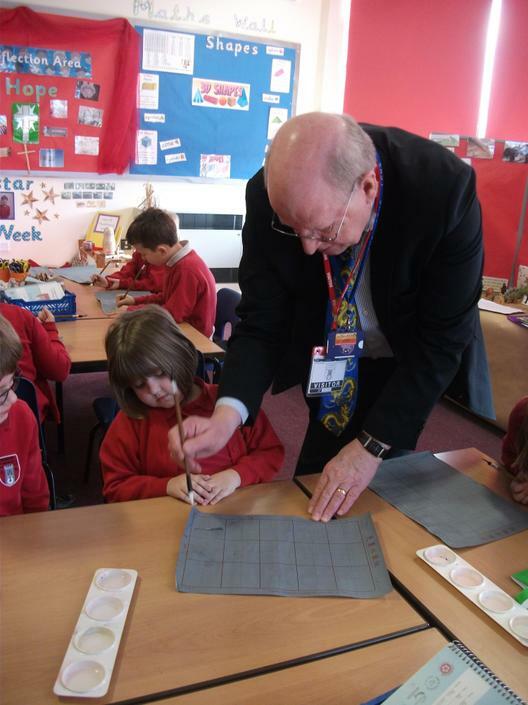 Thank you to Mr Chris Williams - an ambassador for The British Council - for visiting our school to make the presentation! 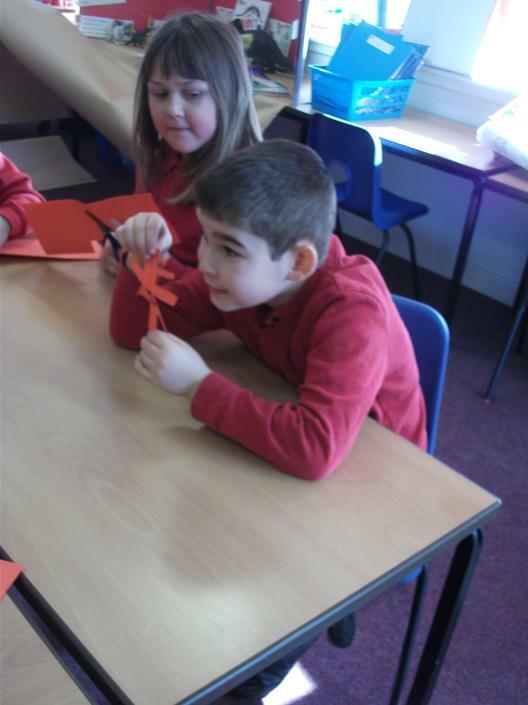 The children had a fantastic day in school for French Day and took part in some of the following activities: dancing; singing; eating French food; making Eiffel towers; craft activities...as well as speaking French! It was an enjoyable day - thank you to Madame Byrne and Mrs Gaskell for organising the day and to the teachers for planning super activities! 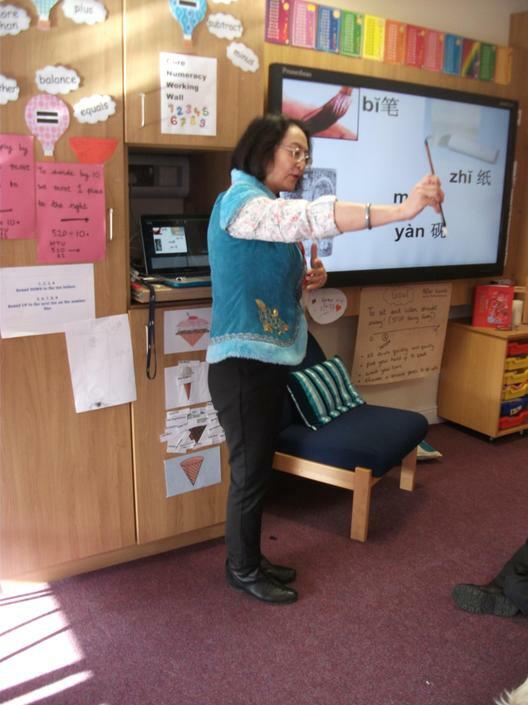 Some teachers from Tangshan, China visited us as part of our Connecting Classrooms project. We had a whole school welcome in Church, the teachers visited our classes and watched us perform our morning exercise. Mrs Hodson, Miss Greenslade and Mrs Gaskell also took our visitors to Tattershall Castle! 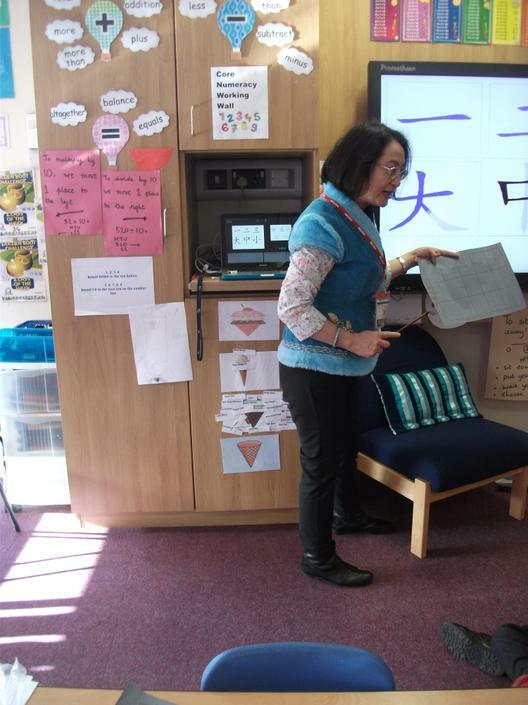 The children in Classes 3G & 6G exchanged work with Classes from our partner school, and Ms.Yan taught the children how to write some Chinese characters from the name of our partner school. We enjoyed showing our Indian visitors around our school today. A Head Teacher and a Mathematics teacher from a very large primary school in Dehli, in India visited us this morning. They spent time in different classes and talking to the children. 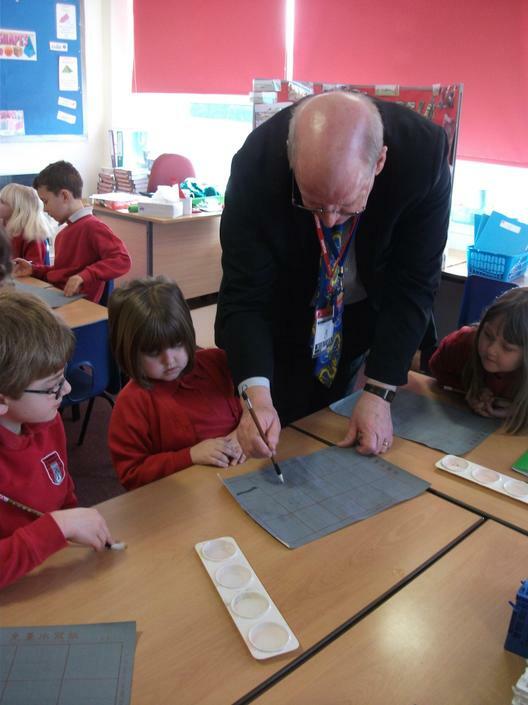 They thoroughly enjoyed their visit and commented on our wonderful school and children. 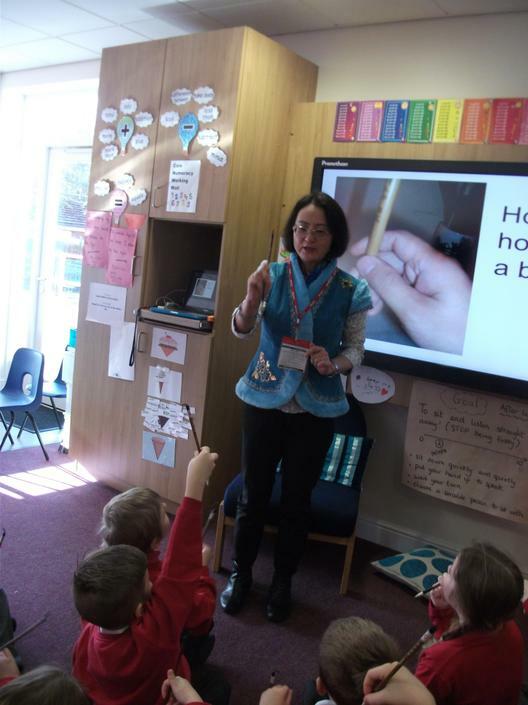 We looked at different traditional clothes from India. Mrs Phillips and Mrs Hodson also dressed in saris. 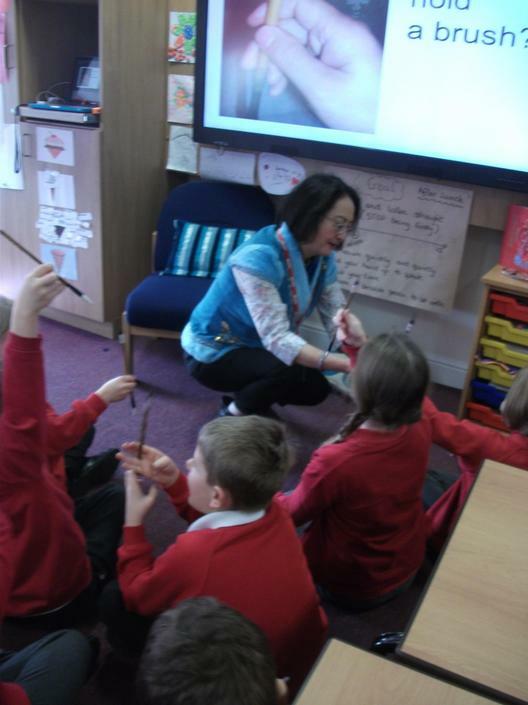 We had a fantastic morning with Ms Chen, a Chinese teacher, and Mr Williams, the British Council Ambassador for Lincolnshire. They came in to introduce 'Chinese New Year' to our whole school in assembly and then spent some time in 3G and 6G. Take a look at some of the photographs! Class 3G - Connecting Classrooms project. 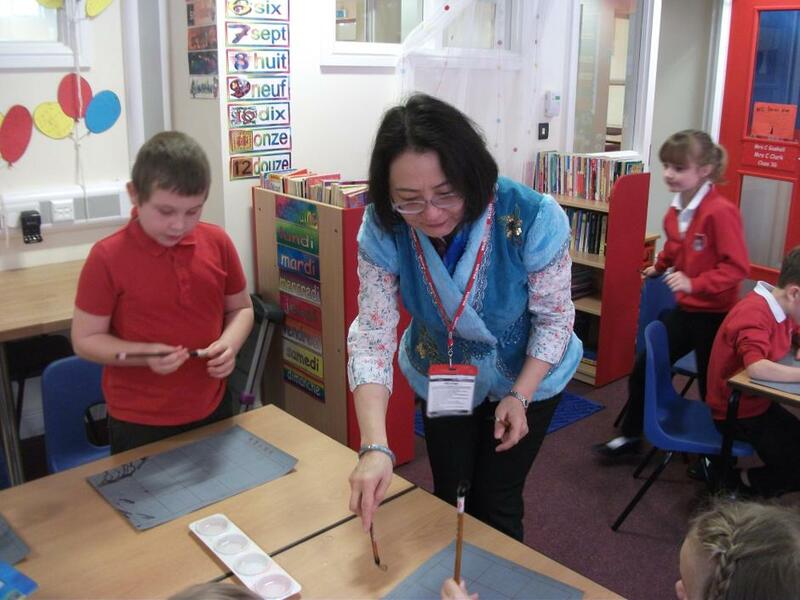 We received some work from the pupils at Lubei Experimental Primary School. It showed us how they celebrate their New Year (Spring Festival). We think it is extremely important that the children at Coningsby St Michael's have a rich and diverse curriculum, so this year we have re-applied to the British Council for our school to be awarded an ISA. As a result, we have planned plenty of fun-filled activities for our children, teaching them about life and cultures outside of the United Kingdom. Please see attached action plan. We look forward to hearing your comments and feedback about the different activities via our evaluation forms! In June 2014 Ms Zhang and some head teachers from other schools in Tangshan visited our school. We welcomed our visitors in a special service in our church, then showed them around our school. They were a couple of very exciting days!!! Lubei Experimental Primary School in Tangshan in China. Take a look at some of the written work by the children in Class 3G. We wrote information sheets to explain the ways in which we celebrate the New Year in England and then sent the work to the pupils in our partner school.